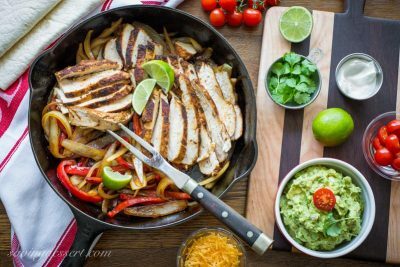 Skillet Chicken Fajitas ~ incredibly easy to make, loaded with bold flavor, sweet sautéed vegetables and tender, juicy chicken. You may not need to add all the extras that cover up a good tasting fajita, but I understand … I love them too! A dollop of sour cream, a few sprinkles of shredded cheese, chopped tomatoes and maybe even a smear of guacamole, all wonderful toppings that compliment the flavorful chicken, peppers and onions. I’m loving all these food holidays that originally had nothing to do with food. 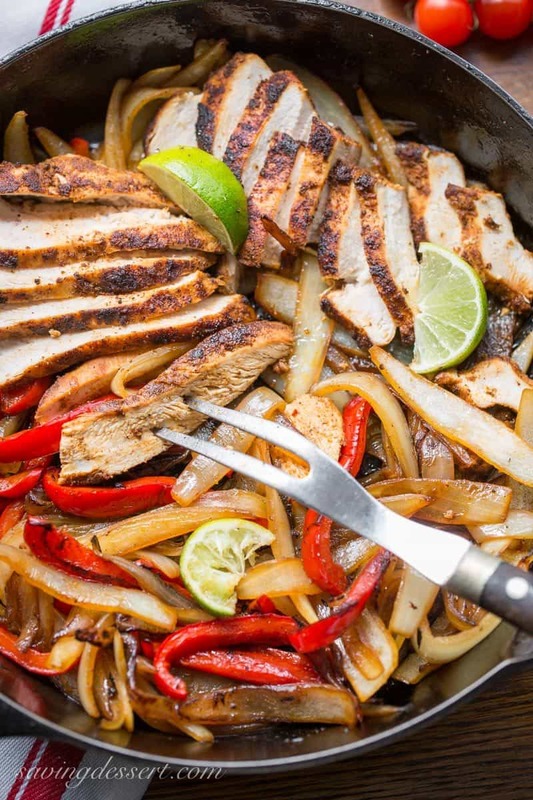 Skillet Chicken Fajitas are super easy to make and on the table in under an hour. Today I’m featuring another beautiful cutting board hand crafted by my friend Michael from Michael’s Woodcraft. If you haven’t check out his website yet, please do! There are plenty of great ideas for Mother’s Day and Father’s Day, or the foodie in your life! Incredibly easy to make, loaded with bold flavor, sweet sautéed vegetables and tender, juicy chicken. In a large, ziplock bag, combine the chili powder, cumin, garlic, and Sriracha. Add 2 tablespoons vegetable oil to the bag and mix to combine. If the chicken breasts are not uniform in size, place them in a clean ziplock bag and gently pound with a rolling pin to an even thickness. Add the chicken to the marinade, turning once or twice, and set aside while preparing the vegetables. Heat a large cast iron or nonstick skillet over medium-high heat. Add 1 tablespoon of vegetable oil and heat until shimmering. Add the chicken breasts and cook, undisturbed, for about 4-5 minutes or until seared on one side. Turn the chicken over and continue cooking until browned and cooked through, about 4-5 minutes more. Remove the chicken from the skillet and set aside tented with foil to keep warm. Carefully and lightly, wipe out any large, burnt chunks from the skillet with paper towels. Add the last 1 tablespoon vegetable oil to the skillet and heat. Add the vegetables and cook, stirring occasionally, until the vegetables are soft and beginning to brown, about 7-10 minutes. Remove the vegetables from the heat and stir in the lime juice. Slice the chicken and add to the vegetables, squeeze on a little more lime juice and serve immediately with warm tortillas. If you’re looking for a few more recipe ideas for your Cinco de Mayo celebration, we can help! Check out our favorite Sweet Corn Salsa, and the always wonderful Pineapple Salsa. We also love our Homemade Refried Beans served on tostadas with a simple sauce made with mayonnaise and Cholula hot sauce. Our next family get together will feature this delicious Grilled Chicken Taco Salad with spicy homemade chips. We’ve got your dessert covered too with an easy Frozen Margarita Pie with a Pretzel Crust or our Creamy Margarita Pretzel Bars. How about these amazing Green Chile Chicken Smothered Burritos from Valerie’s Kitchen? They look absolutely drool worthy. As you can tell, we love our Mexican inspired recipes and can’t wait to share a few more with you! Remove vegetables from heat and stir in lime juice….you mean stir juice into vegetables outside of the pan? Or is the juice going in the pan, with the vegetables pushed to the side of the pan? That just means remove the skillet from the heat before adding the lime juice to the vegetables, because you don’t want to cook the lime juice, it’s best when fresh, tart and bright. You can transfer the vegetables to a serving bowl and toss the vegetables with the lime juice or add the lime to the skillet then the chicken. Anyway you want to add it is fine, as long as it is not cooked. Hope that helps. Me too Susan! They’re so filling and there is always too much – but so good too! Thank you Mimi! Hope you are well. Oh, my gosh, my mouth is watering! 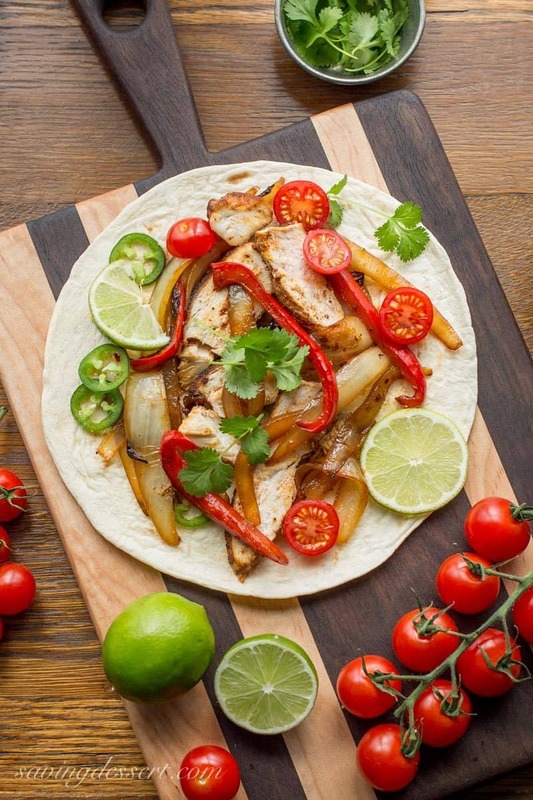 I love, love chicken fajitas and yours are picture perfect!! I’ll have mine with a big dollop of your fabulous guacamole! How fun, vibrant, and festive, Tricia! You’ve totally inspired me to have a fajita night. I know my fellas would love it and I’m always looking for some new recipe to try for weekend dinner (tonight, I tried a Vietnamese style marinaded chicken : ). This looks fabulous! Hope you had a great weekend. I hope you’ll post your marinated chicken Monica – it sounds lovely! We did have a very nice weekend – thanks for asking. Happy May! Great shots Tricia and the fajitas look killer. Thank you Larry! Tender chicken wrapped up with onions and peppers – all you need is an egg! Love celebrating Cinco de Mayo, spicy fajitas are the best, they look delicious Tricia!!! My birthday is May 6th, always celebrate my birthday and Cinco de Mayo together!!!! Gorgeous pics! Happy birthday Michael! Sounds like a great way to celebrate – hope you have a lovely week. This is such a tempting meal. Beautiful. Thanks Tanna! Hope you have a nice weekend but know you will be nervous. Take care and know we are praying for your and your sweetie! Oh my, this looks so delicious. I love this kind of food. I love the spices and simplicity of your recipe. Thank you Gerlinde. Hope you’re having an amazing trip! 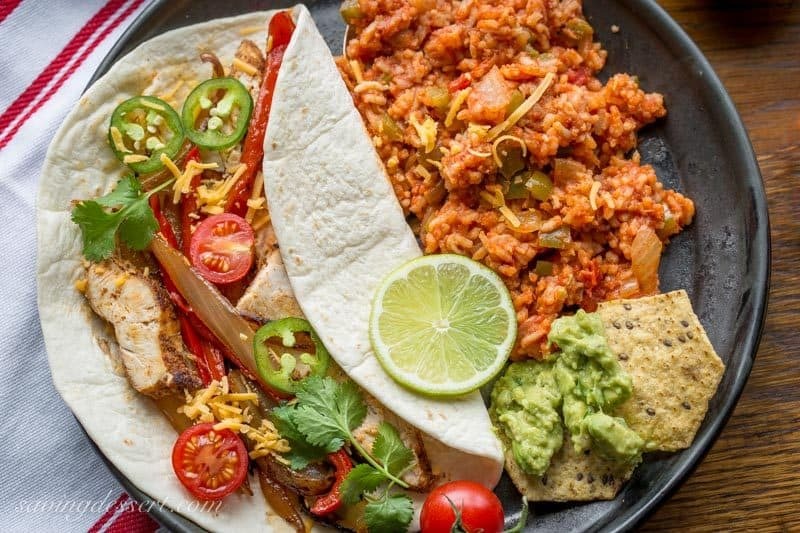 What a wonderful way to celebrate Cinco de Mayo, though this meal is perfect anytime of the year, love how you spiced the fajitas up Tricia. Gorgeous pics! Thank you Cheri – these fajitas have plenty of flavor, just the way we like it! 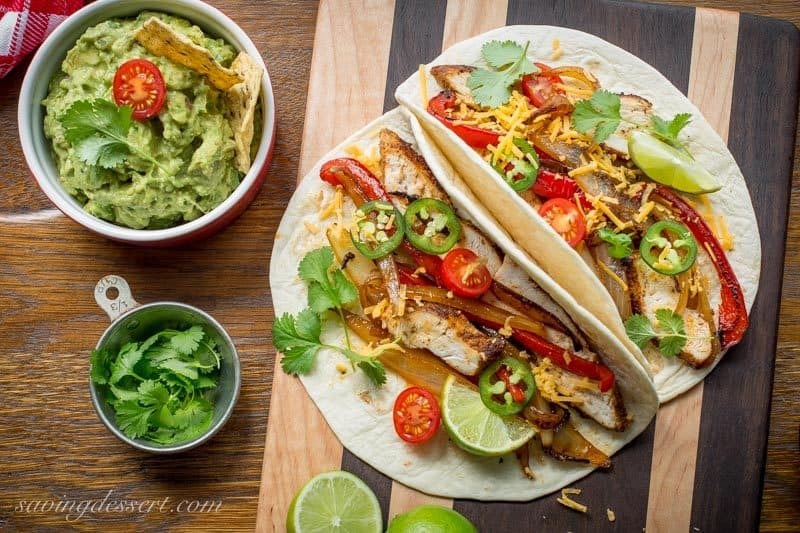 This looks so juicy and delicious, you’ve got me craving fajitas now Tricia, I can’t wait for Cinco de Mayo! Thanks Sue – they really are delicious and well spiced! Looking good:) Delish actually..totally intrigued by the no makeup over 50:) have to go look..! Thanks Monique! I don’t wear makeup as often as I used to and love the bare feeling but not so much the look on me 🙂 Enjoy! Sweet, juicy and packed full of flavours…what a great skillet meal! I always think of you Jennifer when I get out my cast iron pan – you make some amazing recipes in yours! Thanks – have a great weekend. Hola! I love everything about this vibrant, fresh, healthy and super delicious looking dinner! My family would go crazy over it! And hola to you too Chris! Thank you so much. This is a family pleasing recipe for sure 🙂 Have a terrific weekend!